This level has medium difficulty. 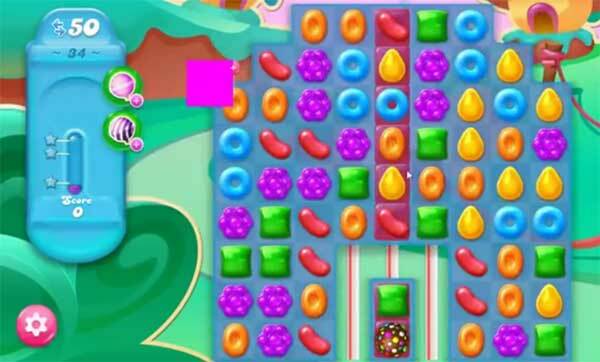 For this level try to play more from the bottom of the table to shuffle the candies as it will help to spread more jam. Or break the candies atlease single with jelly to spread it to near candies. I also only have 25 moves to start? Moves were reduced within the past week from 50 to 25. There’s no way of getting through the entire game. Is there a solution to the 25 moves instead of 50? I only have 25 moves instead of 50. What can I do? Just passed it. Ugh 25 moves that’s insane. I went looking for help like the rest and just happened to get lucky. 1st level I was able to get a stripped candy next to a chocolate sprinkle thing and cleared most the 1st level quicker. With 17 moves went to the 2nd level but I also was able to create 2 more chocolate sprinkle things. And also had to use 2 of the lollipop hammers to pass with zero moves to spare. Good luck all!